This attractive holiday home is in the small town of São Martinho do Porto. The town is on the Costa de Prata, the famous ‘Silver Coast’. The holiday home is 900 metres from the beach. The apartment is in a small complex within easy walking distance of the beach, town-centre and boulevard. The apartment is on the third floor. There is no lift. It is comfortably furnished. There is a spacious seating area, reading area and a small bar in the living room. The living room and both bedrooms have access to the balconies. 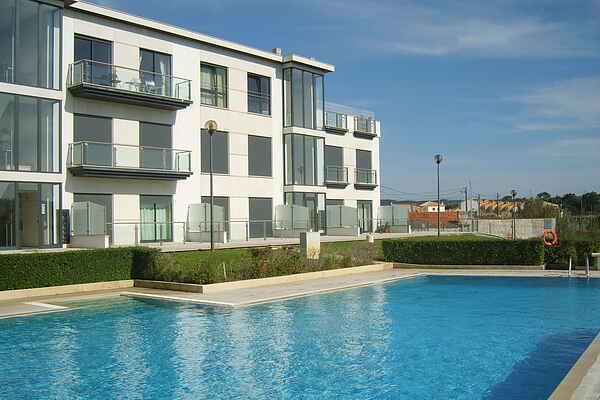 The complex has a large communal swimming pool where you can enjoy the delightful Portuguese climate. The town of São Martinho do Porto is a pleasant seaside resort. There are plenty of pavement cafes, restaurants and old narrow, winding streets. The bay is almost a perfect semi-circle, making the beach one of the most beautiful in Portugal. The sandy beach is slightly sloping and the sea is calm. The beach and bay are perfect for families with children, swimmers and lovers of water sports. The picturesque villages of Salir do Porto and Nazaré are well worth a visit. The holiday home is perfect for discovering the beautiful Costa de Prata. You can visit and explore historic cities such as Òbidos, Batalha, Alcobaça and Leiria. Portugal’s capital, Lisbon and the town of Sintra are about an hours drive away. Visits to both are highly recommended.